XL Displays is the official UK distributor and service partner for X-GLOO worldwide. We have just launched this range of creative and innovative inflatable event tents which offers your business huge marketing and promotional potential. Designed, engineered and manufactured in Germany, the X-GLOO is an iconic igloo-shaped event tent which is functional and versatile. With extensive customisation and colour options, you can create a bespoke X-GLOO to suit your business and brand needs and provide maximum brand exposure. The X-GLOO inflatable event tent is perfect for any company wanting to take their brand to the next level. This flexible and lightweight display solution is designed for large scale indoor or outdoor events and can be used in all weathers. 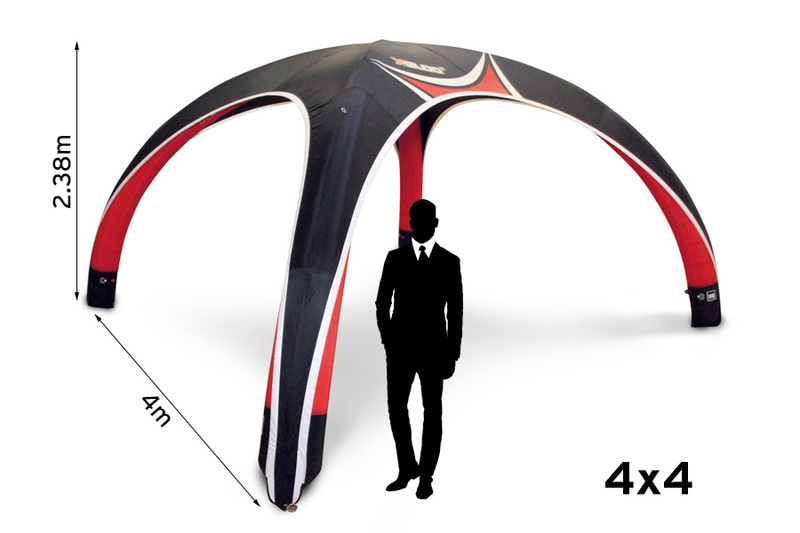 It comes in four sizes, from 4x4m up to 8x8m. X-GLOO is suitable for a wide range of events including sporting events, fun runs and outdoor exhibitions. Due to the size and footprint these tents cover, they are widely used to promote cars and other vehicles and dominate this exhibition and display industry worldwide. The basic unit features an inflatable x-shaped structure – this includes 4 separate legs which are held together at the top and a roof which is attached by a strong and durable YKK zip. 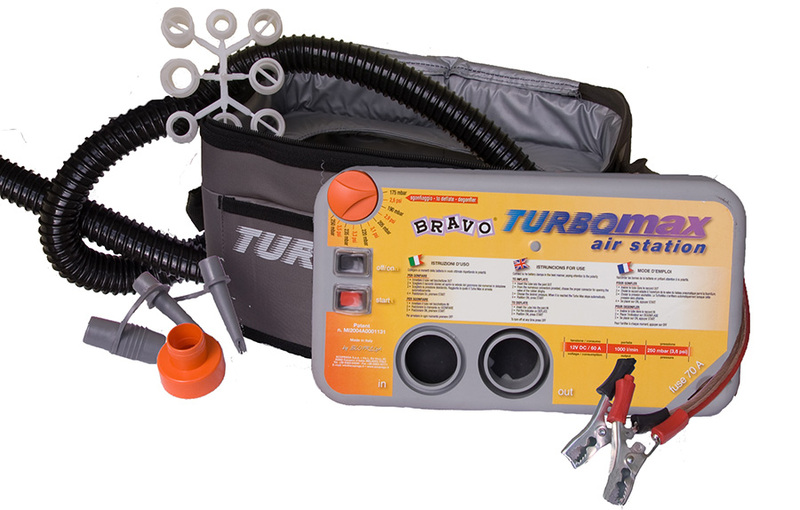 This x-shape structure is inflated using the hand pump (provided) or electric pump (available separately). Because it is inflatable X-GLOO does not have a solid, heavy, cumbersome frame which means it is surprisingly lightweight and easy to assemble and take down. It also packs away neatly into the carry pack provided, making it a highly portable display system. X-GLOO is made from a durable nylon and polyester material which is waterproof, fire retardant (B1 Certified) and UV Resistant so it can be used in all weather conditions. Once inflated, X-GLOO stands securely on most surfaces. We offer a range of anchoring systems which have been specially designed to hold down the inflatable tent in wind speeds of up to 60kmph. The clever and flexible block building system of X-GLOO means you can build up your tent from the basic unit to suit your needs. For example, add on side walls, an entrance wall or window walls to create a more enclosed structure. Alternatively, add a canopy to create an entrance or welcoming area. Linking tunnels are also available to join two X-GLOOs together, even different sized ones. This is a great way to increase your tent size for larger events. 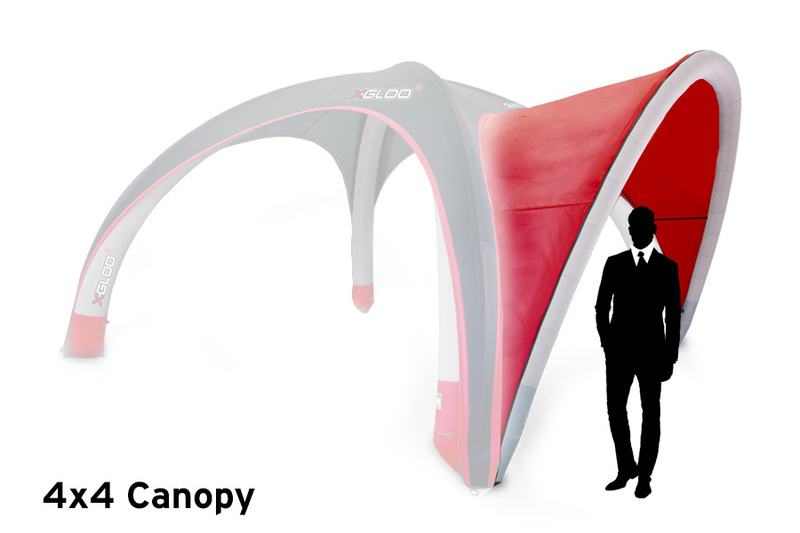 The unique and innovative advantage of the X-GLOO range is that it can grow and change alongside your business and marketing needs, meaning you will never outgrow your X-GLOO. Almost all elements of X-GLOO can be customised in terms of colour or print. Seven plain colours are available – black, white, red, grey, blue, yellow and green. Alternatively to gain maximum brand exposure, elements can be printed with your logo or artwork. You can upload your own artwork or we provide a graphic design service and can design your X-GLOO for you. The unique block building system means that individual components can be changed quickly so you can customise X-GLOO, not only for your brand, but for specific events and marketing messages. 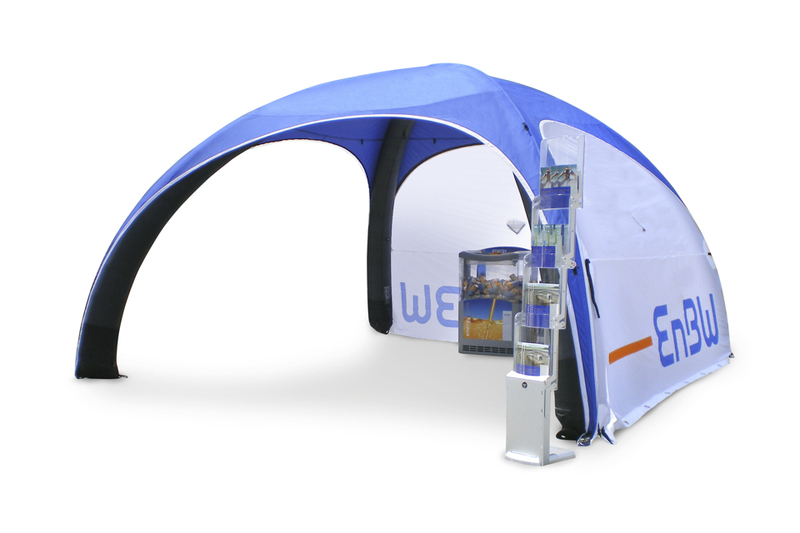 We offer a range of accessories to complete your X-GLOO event tent including electric pump, LED lighting and anchoring systems such as tube ballasts and water ballast barrels. We are the official UK distributor of X-GLOO and we pride ourselves on providing high quality exhibition and display products. We have many years’ experience in the exhibition and events industry and use this knowledge and expertise to advise you on the best exhibition stand for your event. If you send us your own artwork we offer a free artwork check – one of our designers will ensure it is the correct format for the highest quality print. Alternatively we provide a graphic design service and one of our designers will work with you to create a design for your X-GLOO that is right for your brand. We offer award winning customer service – our customers are at the forefront of our work and we do everything we can to ensure they all have the same excellent experience when dealing with us. 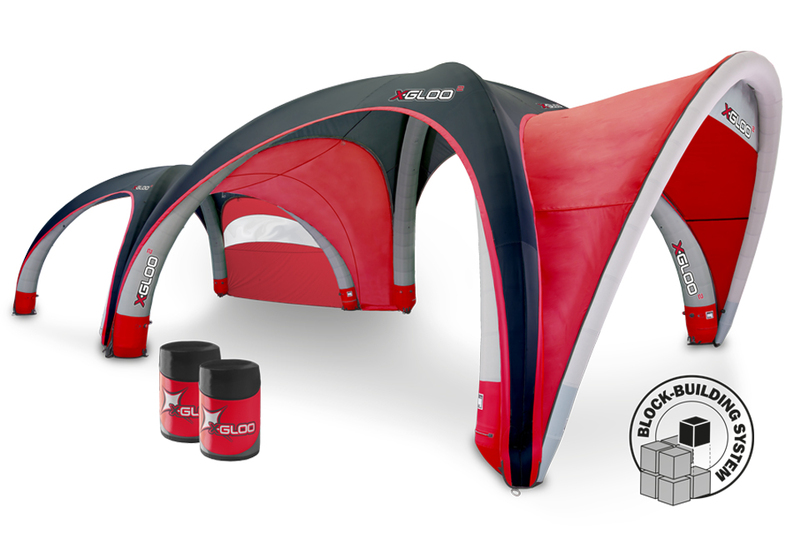 To find out more about our exciting X-GLOO range of inflatable tents please Contact Us or call us on 01733 511030.